Richard Jackson (born 1939) is well known for combining a playful sense of humor and sharp wit with an unconventional approach to painting. Influenced by Abstract Expressionism and action painting, he meticulously engineers sculptural machines that he activates, causing violent eruptions or seeping trickles of paint. In what he describes as his alleged paintings, the liquid pigments — often comically meant to suggest bodily fluids — are spurted, splattered, and sprayed on gallery walls, pedestals, and floors. Born and raised in Sacramento, Jackson studied art and engineering at Sacramento State College from 1959–1961 and held his first solo exhibition at the Crocker Art Museum in 1961. He taught sculpture at UCLA from 1989–1994. While he has lived in the Los Angeles area since 1968, he frequents the Sacramento region where he maintains his family’s ranch. His work has been shown at museums and important venues around the world. Consisting primarily of works created during the past two decades, Big Ideas: Richard Jackson’s Alleged Paintings demonstrates the many ways in which the artist questions and upends traditions in the contemporary art world. Pump Pee Doo, for instance, is one of several large installations included in the exhibition. Its title is a pun intended to sound like the name of the French institution in which the work was first shown: Centre Georges Pompidou in Paris. Added to this witticism, the installation takes the official state animal of California, the grizzly bear, and stands several of them at urinals. Some of the bears even have urinals for heads. This reference to Dada artist Marcel Duchamp’s 1917 Fountain (a “readymade” urinal) illustrates Jackson’s appreciation for the debate Duchamp triggered regarding what constitutes art. In another installation called Little Girl’s Room, a red-headed girl in a green dress smiles as she lovingly clutches a pink unicorn — standing on its horn — atop a spinning platform. 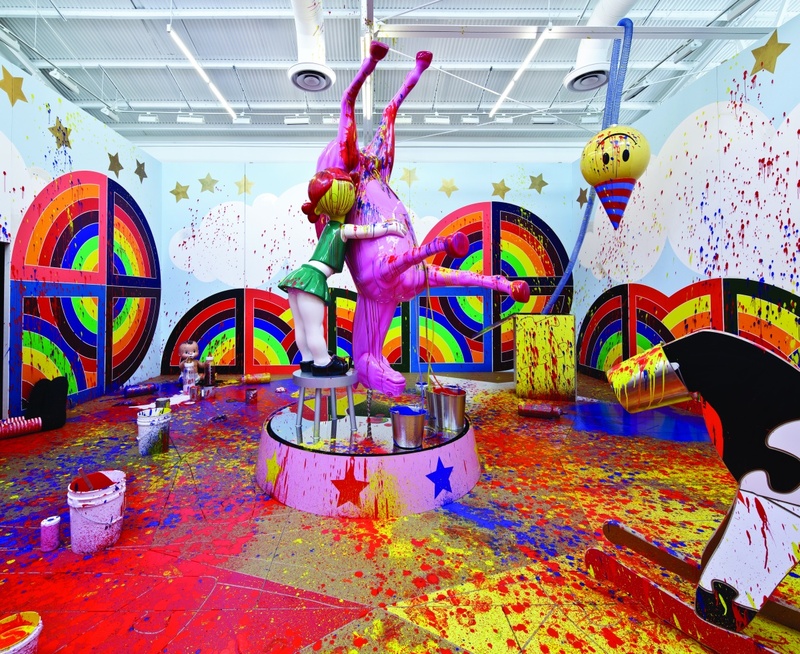 Surrounding the pair is a colorful room outfitted with a hobby horse, a baby doll with bottles filled with various colors of paint, a giant stuffed clown, and an enormous jack-in-the-box with an emoji-like head. The unicorn has essentially marked its territory, having sprayed everything with primary colors. Jackson’s recurring use of these colors is not arbitrary, but rather a reference to celebrated color field painter Barnett Newman’s iconic series, Who’s Afraid of Red, Yellow and Blue. Jackson’s appreciation for some of the legends of art history extends to Abstract Expressionist painter Jackson Pollock, whose drip paintings continue to inspire countless artists. Richard Jackson draws from a broad visual lexicon, which includes not only the domestic environments and universal human and animal functions mentioned above, but also what he sees as hallmarks of American life, such as consumerism and sporting life. A hunter himself, Jackson includes numerous representations of ducks in his work. With their enlarged eyes resembling women’s breasts, Jackson’s ducks are designed to ooze, spray, and drip paint from various orifices. Another of Jackson’s alleged paintings deals more directly with shooting. The seemingly more traditional painting La Grande Jatte (after Georges Seurat) recreates the painting by the famed pointillist painter, only this time the dots are created with pellets shot from a paintball gun. In earlier works, Jackson would often use stretched canvases as tools. In some cases, he would load their surfaces with paint and smear the canvas faces against the wall to create colorful arcs. In others, he stacked the canvases like blocks to create enormous constructions. Examples of these “historic” pieces are included in the exhibition, but the artist has moved on. For him, the fun of his work is in trying new things. Big Ideas: Richard Jackson's Alleged Paintings is on view at the Crocker April 28 - August 25, 2019. Richard Jackson, Little Girl’s Room, 2011. Fiberglass, steel, stainless steel, mdf, acrylic on canvas, wood, rubber, motor, acrylic paint, 190 x 288 x 312 inches. Courtesy the artist and Hauser & Wirth. Installation view, David Kordansky Gallery, Los Angeles CA, 2011 Photo: Fredrik Nilsen © Richard Jackson.